Group training is quite common nowadays, especially for women. There are many health and fitness clubs offering group fitness classes. Some enjoy being in a group fitness program. There are also those that are against it. Find out the pros and cons of training in groups. 1. Group training is more fun than training solo. Training solo can be quite boring, especially if you are new to the gym or fitness studio. 2. Group training lessens the likelihood of skipping workout sessions. When there are friends to accompany you in the workout, it lessens the likelihood of missing a session because you would not want to let them down. 3. Group training offers more motivation. Working out in a group makes it easier to go through difficult workouts because you know there are other people going through something similar with you. 1. Individual needs cannot be addressed. A group training is created for a general audience. Therefore, the needs of each individual may not be addressed as the program is not customized. 2. Incorrect form cannot be spotted easily. Due to a large number, your instructor may not be able to spot if you are assuming an incorrect form. Your form may not immediately be corrected. 3. Runs the risk of overtraining. Since the instructor need to attend to several members, individual progress is difficult to monitor. Your instructor may push some of the group members, including you, to overtrain. When it comes to group training and workout, men shy away from them. Compared to women, there is a very small percentage of men who actually go or want to try group training. One of the reasons is that they think group fitness classes are mostly aerobics and toning exercises. Men would rather engage in strength and weight training than do cardios. However, what most men do not know is that there are many group fitness classes that are customized for men. Boot Camp or Quicksand is a popular group workout for men. It combines plyometrics with speed drills. Aeroboxing is also another appropriate group training for men. It is mainly plyometric exercise that simulates boxing movements. Another similar workout is cardio kickboxing, although the latter is more on dance moves which most men do not prefer. Group cycling is also a good way to do your cardios. It’s actually stationary cycling with different resistance levels and speeds. Still, it’s more fun to do it with friends. When it comes to staying fit, always explore all possibilities. Quite frankly, monotony in a workout can cause you to quit or skip sessions. Give group training a try if you still haven’t. Who knows, you might find it more enjoyable than training solo. 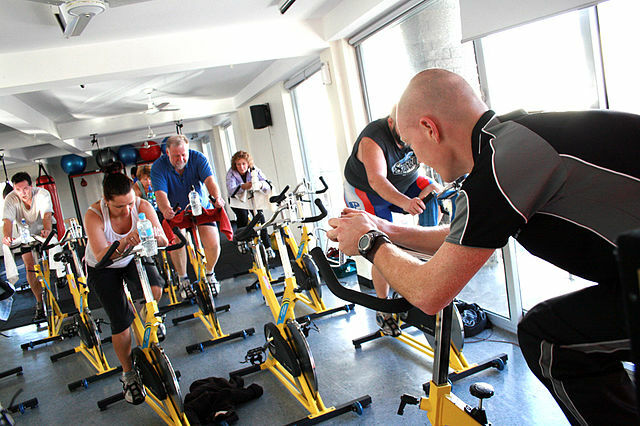 Photo credit: “Cycle Class at a Gym” by www.localfitness.com.au – Own work. Licensed under CC BY-SA 3.0 via Wikimedia Commons.